I wanted to add that while the meals we will prepare in our weekly menu’s are pretty much carved in stone for the week we do allow ourselves to swap one meal from later in the week with one meal earlier in the week. Tonight Mike’s mom is going to join us for dinner and since she is a vegetarian we are going to make tomorrow’s vegetarian flat bread pizza with tonights chicken teriyaki stir fry! I really wanted her to try this new dish and she wasn’t available to join us tomorrow! It’s Monday again which means I’m now officially 21 weeks pregnant! I don’t have much to report this week because I’ve been so busy that I’ve barely had time to contemplate pregnancy. I worked a 48 hours work week over the past five days and today my body is feeling really worn out so I’m trying to give it a much needed rest. I’m starting to feel more definite and consistent movements which is nice but I’m still not sleeping so fantastically. I can’t complain because I know its all just part of baking a baby so instead of moaning and groaning I’m trying to just keep looking forward to the next exciting moments of pregnancy. 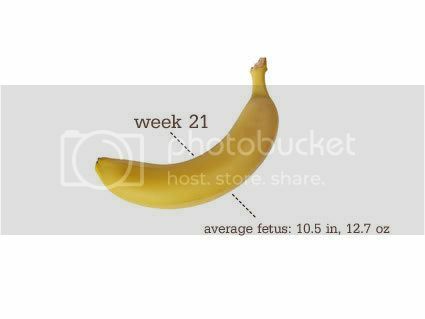 This week the baby is as long as a banana! 10.5 inches! When I think about the baby being 10.5 inches it brings me to Jacob being born at 18.5 inches which is just under double what the size of the baby is now. Hard to believe how quickly the baby is growing in that belly of mine! Of course Jacob didn’t stay that small because he’s now pretty much off the charts for height! 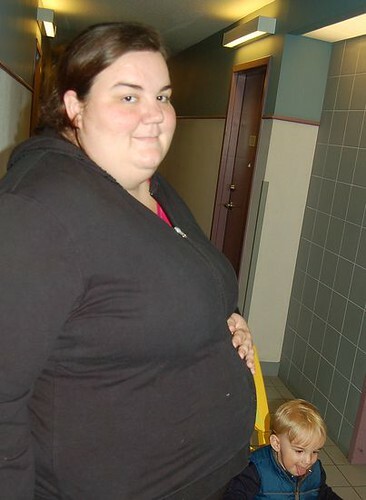 For the first time ever and quite possibly the last I am allowing a pregnant shot of me to show up on the world wide web! Don’t get use to it folks because I’m pretty anti publishnig photos of myself but I didn’t think this one looked too horrible….except for my lovely double chin and expressionless face! I think perhaps my son’s face says it all! ha! This week I’m waiting on the results of Maternal Serum Screening last week and I need to call my doctor to reschedule my October prenatal appointment since apparently she’s going on vacation. Coming up on Wednesday we have our follow-up ultrasound to our Anatomical Scan so that we can get the rest of the measurements we were unable to get in previous ultrasounds. Like I said, a rather boring week overall with not much to report on the pregnancy front…Just how I like it. Yesterday at the park Jacob attempted to climb a wooden panel that is ladder like but the little steps on it are only about 1 inch in width. Watch as Daddy (with the video camera) gets up quickly from his bench and hurries to be close when Jacob gives him a heart attack. Despite two suggestions from Daddy that Jacob just might be too small to climb this panel…..Jacob proves otherwise as always…..THIS my bloggy friends is why Jacob shall be a monkey for Halloween this year. Climbing In The Park, originally uploaded by Parenting Peanuts. Our quest to be more budget savvy when it comes to grocery shopping, eat a little more healthy, and be a “greener” family continues with week #3 of our Meal Planning…. While in the park the other day, Daddy caught Jacob making his way up the chain/wood ladder with our Flip Video camera. It’s just a cute video I thought I’d share! I was trying to take an afternoon nap before work and the phone started ringing…normally I would avoid answering the phone when I am trying to rest but something told me I should get it this time. I was a bit disoriented when I answered and it took me a few moments before I finally realized that it was my mother calling me to say hello from her European vacation. The last time I had spoken to her was a week ago when they had arrived in Paris and the second time she attempted to call me she had gotten Mike during a time when I was at work so needless to say I was quite happy that I was home to receive her phone call. It turns out that Mom is not that impressed with Rome because she finds it very dirty and full of graffiti and it didnt’ help that she got sick the day they left Paris and wasnt feeling well for her first two days in Italy. Mom said it was really expensive to eat out in Rome and that dinners out are costing them about 52 Euro’s on average….about the equivalent of 70 dollars Canadian! Crazy! Mom said she spent some time today visiting the Vatican and she was able to get the kids (Jacob and the new baby) the St. Christopher Medals that I wanted each of them to have….I grew up in a Catholic Family and St. Christopher is the patron Saint of Travel/Travellors. Jacob already has a St. Joseph medal (The Patron Saint of Families) that he was given by my mother at his baptism but I thought St. Christopher represented a good sense of protection. Without an in depth explanation it’s just a very nice thoughtful gift…especially when it comes from the Vatican in Rome. Overall, Mom said she’s having a good time and I’m glad for that because she really deserved a nice vacation. The next time I talk to her will be when she arrives in England for the final leg of her trip! My mother is currently on vacation in europe for 2.5 weeks and this morning Jacob pulled the great big laminated map out and asked Daddy “let’s see where Nana go vacation”. Mike and I both looked surprised and watched him spread out the map on our living room floor. Mike asked him where Nana and Papa went and Jacob proclaimed that they went across the ocean on an airplane all before telling us that Nana and Papa went on vacation to get him a present. Ha! I remember my mom telling him before she left that she was going to bring him back a present so for some reason that is all he could remember. After a bit of conversation where we tried to tell Jacob that yes Nana and Papa were bringing him a present but they were also on vacation to have fun….Mike pointed out France, Italy, and England on the map (the places Nana and Papa are visiting) and now we are waiting to see if he remembers tomorrow. I’m completely blown away by his interest in this map (as I said before) but I am definitely not pushing him to learn about world geography (geesh the kid is two) but if he’s the one to initiate it…I’ll go with his flow. We took a little video footage of Jacob pointing out some of the countries that he knows…I want to be able to show him this video when he’s older and show him some of the things that interested him when he was smaller. I’ll be curious to see if he’s still interested in maps and geography when he’s older. Last night on our evening walk as a family we stopped at a park to play for about an hour and it wasn’t long before I realized that I was shivering from cold. Mike continually asked me if I wanted to go home but my reply was that I wanted Jacob to stay out and enjoy the night crisp night. Unlike myself, Jacob was properly dressed for the weather and while I was smart enough to grab a hooded sweater on my way out the door I was not smart enough to put on a pair of clothes toed shoes and alas the heat from my body was escaping through my feet. I didn’t want to accept Mike’s offer to go back to the house because I wanted to savor the weather for fear the summer heat and humidity might return to sabotage my hopes of the fall weather appearing earlier then last year. The truth is, I found myself actually enjoying some time out of the house for the first time since I became pregnant in May because for once the humidity wasn’t causing me to feel swollen and sweaty…for once I could actually hang out with the wind and the chill of the approaching fall without wanting to return to the shelter of my air conditioner….it was like being freed from a cage; It was remarkable. I hope this weather will stay around of our trip to the Apple Farm on September 27th because it will make it all the more enjoyable and I promised Jacob we would pick apples to bake a pie together. Mmmm…I can already smell the apples and cinnamon as they settle into the crust and fill our house with their sweet aroma. Jacob and I just got back from our park trip and I was pleased to be greeted with the familiar wind and chill of the night before….if the weather could stay like this until the baby arrived I would finish my pregnancy in complete bliss. The fall is definitely “my time of year” and I’ve eagerly awaited its approach over the past 6 weeks, sensing that it would bring me a renewed sense of being. Not being brave enough to climb the park aparatus, I sat and watched Jacob as he ran around the structure and I smiled and inhaled the air and chatted with him as he played. It’s been a great couple of days….indeed it has.